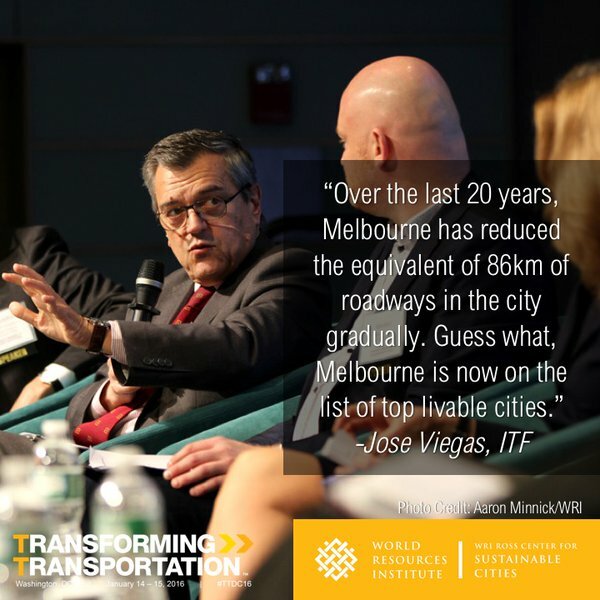 Transforming Transportation (#TTDC16) is the annual conference co-organized by EMBARQ, the sustainable urban transport initiative of the World Resources Institute’s (WRI) WRI Ross Center for Sustainable Cities, and the World Bank. 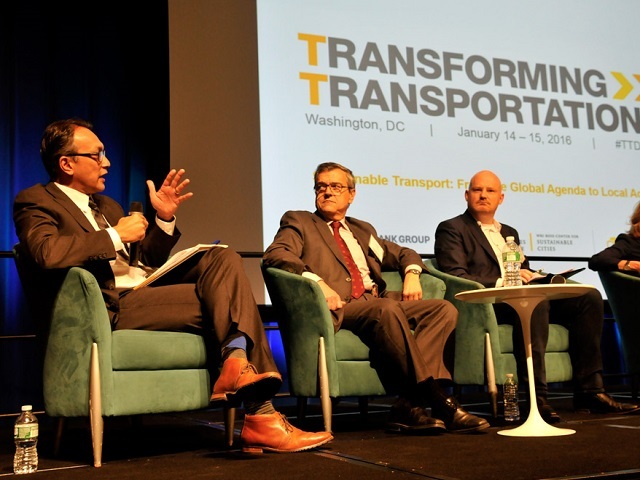 This year’s conference is themed Sustainable Transport: From the Global Agenda to Local Action, and takes place on January 14 and 15, 2016 in Washington, DC. 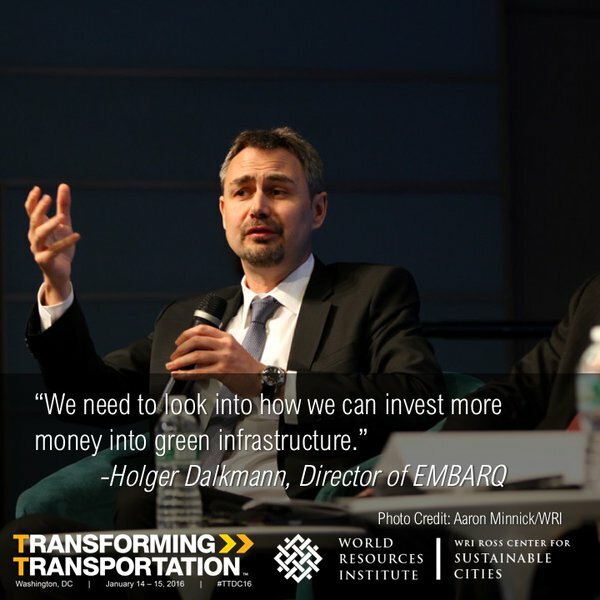 Join the conversation on social media with the hashtag #TTDC16, by following @WRIcities and @WBG_Transport on Twitter, and tune in to www.transformingtransportation.org for video streaming of select sessions. “Whether Paris is a success will be judged by what we do now.” With these words, Andrew Steer, President and CEO of World Resources Institute, captured the spirit of Transforming Transportation and kicked off Day 1 of the conference. As Mr. Steer noted in his introductory remarks with Laura Tuck, Vice President for Sustainable Development of the World Bank, 2015 gave us several major global commitments, including the Climate Agreement, the Sustainable Development Goals, and the Brasilia Declaration on Road Safety. 2016 will be all about translating those commitments into action on the ground in cities. But how quickly can we act? Our climate is still changing, and we will need much more than the incremental approach we have now. We need disruptive solutions that can catalyze systemic change at a global scale. We have to ask the fundamental question of how we design our cities. In the morning of Day 1, discussion particularly touched on the theme of integration–integration of our goals, our planning, and our transport modes. As Naoko Ishii explained, we need to stop viewing decisions about climate, transport, and development as independent. A new report from the New Climate Economy finds that the world could save US $3 trillion over the next 15 years if we designed our cities in a smart way. However, we won’t achieve compact, connected, and coordinated cities if our decision making processes occur in silos. Moving away from single-sector investment and planning to an integrated decision making process and approach will be key to unlocking disruptive change. While it’s key for leaders to align policies and climate, it’s also crucial for cities to integrate various modes of transport. After all, while transport modes such as light rail and bus rapid transit (BRT) systems can move passengers quickly, it’s impossible to connect every home directly with a train station or bus stop. Suresh Prabhu, Union Minister of Railways in India, stressed that “We need a multi-modal transport policy,” explaining India’s demand for integrated light rail. The leaders also highlighted the major connection between public transport and the quality of life of citizens: “Changing the transport profile is extremely important to reach the [climate] goals, and not only environmental goals, but also quality of life,” said Suresh Prabhu. The challenge for community leaders and city governments, however, is translating these ideas into local action. Ani Dasgupta, Global Director of WRI Ross Center For Sustainable Cities, explained that while have global examples of what works–such as BRT–cities must share best practices and localize policies for them to be most effective. Copy and pasting the approaches of Copenhagen’s public transport for Mumbai, for example, simply would not work. One major hurdle for local action is political capacity. “The key question is how do you build that technical capacity [for sustainable policies] in a politically savvy way?” said John A. Roome, Senior Director of Climate Change Cross Cutting Solutions at the World Bank. Roome illustrated that when civil society fails to consider local political climates, it’s far more likely to make mistakes, and implement solutions that fail to meet local needs. The morning wrapped up with a discussion of the role of national governments in enabling cities to take action. As Holger Dalkmann of WRI Ross Center mentioned, “it’s about the enabling conditions level set at the national level.” If national governments encourage cities to get their own funding, for example through land value capture, then cities can generate their own revenue and reinvest it in sustainable transport solutions. Furthermore, national governments are essential in building capacity and ensuring that institutions work efficiently. Far too many governments serve as a restriction on cities rather than an enabling force. Going forward, this needs to change.